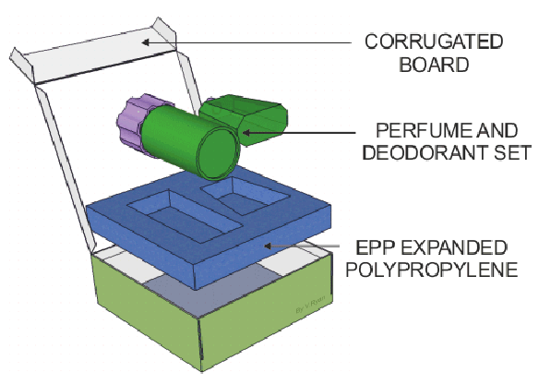 A deodorant and perfume manufacturer has changed its main packaging material from its traditional tin, to corrugated board. 8a. How will the manufacturer benefit from changing to corrugated board? The manufacturer will benefit in a reduction in the cost of the packaging material. Corrugated card can be formed into an large number of shapes, and with greater ease. An additional benefit is a reduction in the cost of manufacture. The surface of corrugated card can be printed on more easily (as flat card) and again at lower costs, as inks rather than paints can be used. The manufacturer can claim that the new material is more environmentally friendly, as it can be recycled and used again. Corrugated card is much lighter than tin/steel and is cheaper to transport as a result. Fuel is saved in the transport of the deodorant set and energy saved in the manufacture of its packaging. 8b. How will the customer benefit from changing to corrugated board? The customer can be satisfied that he/she has considered the environment when purchasing the deodorant set, because card can be recycled, transported more cheaply. Card is more environmentally friendly at every stage of manufacture, compared to tin/steel. The deodorant set will be less expensive, because cheaper corrugated card has been used for packaging. The box will be lighter to carry and cheaper to send as a gift, through the post as a consequence. 8c. How will the environment benefit from changing to corrugated board? The environment will benefit because the card can be purchased from a sustainable source. Trees are replanted as they are processed in the manufacture of the packaging. Less energy is required during the manufacture of the packaging and therefore less pollution produced. Card is biodegradable or can be incinerated. Less fuel is required to transport the deodorant sets to retailers, as they are lighter than the old tin/steel container. 8d. Sketch and name three environmental symbols likely to be found on the new corrugated card packaging.